1) Table Display Easels: Suitable for displaying/holding small-to-medium sized pieces of artwork. 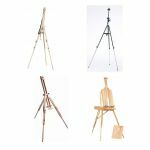 2) Portable Easels: Lightweight and strong, with telescopic tripod legs, these easels are suitable for displaying/holding medium-to-large sized pieces of artwork, for both indoor and outdoor use. 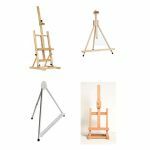 Our easels are made to last from premium quality materials, including high quality oiled beechwood easels and strong aluminium easels. (Don't be fooled by cheaper and flimsy easels sold online!). 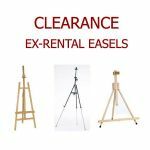 Peace of mind, all of our easels come with a 5 year warranty (we will replace like-for-like if the easel is found to be faulty). 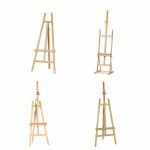 Our sister company, GingerWhite, has years of experience of using these easels to display artwork in the UK. We are so confident in the quality of our easels, that we offer a no-quibble 10 day returns policy for all of our easels.